As most radical Australians would know, the weekend just passed was host to the 2009 Sydney Forum. The two day speakers forum is the premiere free speech event on the Australian radical calendar. Speakers come from all backgrounds and forget their differences to share ideas and network towards a common cause of defeating the system. The forum is organised primarily by Australia First national director Dr. Jim Saleam and MCed by New Right supporter and National-Anarchist, Welf Herfurth. 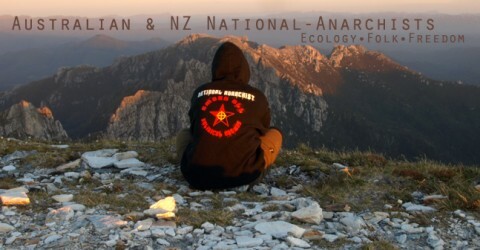 National-Anarchists have been attending the forum since the beginning and regard it highly. It is the only speakers forum where the statement “Neither Left nor Right” and the concept of freedom of speech for everyone is truly adhered to. Speakers this year included an international guest from the Bay Area National Anarchist collective, Andrew Yeoman, a representative from the 9/11 Truth movement, John Bursill and the event featured a most interesting debate between Dr. Jim Saleam and Professor Andrew Fraser on the idea of “Australian identity.” More on the speakers in a minute, a few words on those that attended. Early in the morning on the Saturday (which is the main day for the speakers), a small group of misled youth claiming to be AntiFa began blocking the entrance to the venue hosting the event. Their numbers were no more than about a dozen and they stood with a couple of poorly designed banners, shouting obscenities at anybody trying to enter or leave the venue. Their justification for the abuse (including calling elderly regulars at the club “nazis”) was that the venue was host to “nazis” and “fascists” that had come to voice their opinion on matters that the demonstrators disagreed with. Unfortunately for these protestors, besides of some filming and photos being taken, the attendees didn’t respond to their reactionary protest. Not long after the police came and removed the protestors, the forum began. The audience was close to fifty and included members of nationalist parties, citizens initiated referendum activists, Asian women, 9/11 Truthers including an activist with Aboriginal heritage, National-Anarchists, a homosexual man, Volksfronters and many more individuals and groups were present. The disinformation spouted by the media and believed by the AntiFa kids was once again proven false, the Sydney Forum is not a handful of neo-nazis and skinheads calling for a second Holocaust but rather people from different backgrounds, with different values and ideas coming together to share ideas and fight the system. Some wise words from Welf Herfurth in his opening statement made it clear that we have more in common with the “left-wing” AntiFa than we do with the system and if they were willing to have a reasonable and fair discussion without acting like idiots, they’d be welcome inside to join us. AntiFa had made fools of themselves, they didn’t have the moral high ground and they didn’t “bash the fash” or anything of the sort. Now, back to the speakers. John Bursill from the 9/11 Truth movement delivered a highly thought provoking talk on the controversial questions being asked of the official 9/11 narrative. Did a handful of Arabs hijack planes at the behest of Osama Bin Laden on 11/9/2001, or was it a staged event by the US Government? Regardless of the views held by the audience, the questions were thought provoking and it’s a definite that some may have changed their minds by the end. John Bursill is a dedicated activist and an entertaining speaker, local National-Anarchists look forward to hearing him speak again at another 9/11 Truth event. Probably the most captivating speaker and the farthest from home was Andrew Yeoman, spokesman of the Bay Area National Anarchists. He spoke about community organising and the ideas and activism of the National-Anarchists. He illustrated the need for nationalists to earn legitimacy to be the champions of their folk and the only way to do this was through community organising and frequent activism. The Bay Area National Anarchists are the most active anarchist group in California and the only group in the Bay Area promoting nationalism. The audience sat with keen interest and it seemed that everybody had a question to ask about Andrew’s tribe and the way of life that National-Anarchism promotes. The final segment of the Saturday that we’ll comment on is the debate between Dr. Saleam and Professor Fraser on the topic of “Australian identity.” This year was the first time a structured debate was held at the forum and it was very well received. Professor Fraser held the position that Australian identity must centre not around loyalty to the State, to a constitution or any other idea but rather ethnocentric loyalty – Anglo-Saxons looking out for the interests of Anglo-Saxons – not only in Australia but all over the world. Dr. Saleam argued back that Australian identity lies in the history of the Australian bush poets, politicians and the defining moments in our history – his message included quotes from such Australian figures as John Curtin and Jack Lang. Though both positions were debated intelligently and firmly, it was the opinion of the National-Anarchists in attendance that Professor Fraser walked away with a victory. We look forward to more structured debates at future forums. The Sunday is organised at a different venue from the Saturday and is designed to be a more informal affair, to facilitate discussions and networking for those both interstate and from overseas. Despite childish threats, AntiFa did not show up at the event and everything ran smoothly. We were most impressed with the interest people had in National-Anarchism and once again Andrew took questions from the audience. Guests chatted, ate and exchanged ideas and details, which will most definitely result in future activism. One of the best parts of the Sydney Forum is it inspired, motivates and renews the determination to get on the streets and be more and more active. As the Sunday drew to a close, so did the Sydney Forum of 2009. The whole event was highly successful – the speakers were enlightening, the organising was impeccable and those that would try to shut us up made total fools of themselves and ran away with their tails tucked between their legs. A video will be made available in the near future and future activism as a result of discussions at the forum are already in the works. Well done to the National-Anarchists that attended, let’s get moving! A fair and accurate assessment of the day. I would only add that, for me at least, the debate between Fraser and Saleam was perhaps more close than you suggest – I can’t pick a winner between them. @ndy is fuming, and that too is a good result. Excellent reports from many sources. It seems that the forum has bought Australian nationalists closer together than ever before. I agree….an accurate portrayal of events and yes, I too found it hard to choose between Dr Saleam and Prof Fraser. The real question for me is ‘can the keys to the ‘nations’ be taken back’ or ‘is the globalist agenda actually already complete and therefore are we now forced to be One Family, Many Nations’? If they are truly aware of what our movements are about then they’re evil tools, if they are not, then they are complete fools. Tools or fools? hmmmm…..
What I liked most about Prof Fraser’s speech is the idea of thinking of ourselves as global Anglo-Saxons, or Germanics, or Mediterraneans, or even “whites” but acting towards our best interests on the local level. We don’t have to uphold the State, we just need to look after our own tribe and allied tribes. “Think Global, Act Local” is a good slogan. As for the demonstrators, you’re right, they’re either aware of the political/social ramifications of their actions, or they are just ignorant. I believe that they’re mostly just misled and ignorant. I find the contrast between their meetings and ours amazing, for example when the homosexual man asked his question – if a “racist” announced themselves at a red meeting, there’d be trouble. the so-called “nazis” at the Sydney Forum may have been surprised but certainly weren’t hostile towards the gay man, the Asian girl and part-Aboriginal speaker at the meeting. The so called Antifa that attended the Sydney Forum are the real Nazis. They want to stop free speech. They like their little dogmatic world where they don’t have to think for themselves and behave like lamb. I am always surprised that they call the Sydney Forum a Nazi Forum since I am sure that they never attended one of them in person; how do they know what people actually discuss at these meetings? Telepathy? If the people who protested against the Sydney Forum would be real progressive thinkers they would attend the Forum, or any other political meeting outside their little political cage, listen and think for themselves. But they don’t do that as their political/social security blanket would go up in smoke. In a way they are like the KZ guards in the 3rd Reich or the Gulag guards in Russia, they just follow blindly orders without thinking about it or questioning why they are doing what they are doing. Seems very nice, the closest thing we have near by is the “Jornadas da Disidencia” that starn next Friday. This year I will be lecturing alongside such names as Günter Deckert, Israel Shamir and Christian Bouchet. It is big capital and its political bedfellow, western bourgeois liberalism, that today disseminate the idea of an Economic New World Order (the dialectical evolution of 19th Century bourgeois capitalism) giving free reign to multinational corporations, financiers and banks, to plunder the resources of the world’s cultural landscapes without any restraints placed upon them by sovereign peoples and their laws. The drive towards this New World Order is advanced colonialism in its most insidious form. Where, in the past, colonial conquerors first had to overthrow by force, disease and trickery, today, it is the culture and resources of entire nations and regions they seek to overthrow, with the assistance of advanced technology and the mass media. The alliance between big capital and western bourgeois liberalism includes all Labor Parties and Unions and the great majority of moderate left and right wing political organizations. Where this liberalism has been imposed, sanctioned and controlled by elites (of the UN, the Unelected European Union and successive European and US governments) there inevitably follows a wave of exploitation ( financial and industrial) that not only depletes the resources of regional peoples but attacks the root of their culture, implemented with legal force, political subterfuge and arrogant certitude, the goal being the biological and economic leveling of all cultures towards the single monoculture of the ‘world consumer’. Both multiculturalism, rigorously defended by the extreme left, and the opposing doctrines of nationalism, rigorously defended by the extreme right, serve these controlling interests. The right, being just as stupid by nature as the left, and a little less informed, have swallowed the bait, their campaigns of obnoxious racist diatribe calling for an end to immigration based on racist stereotypes bound up with hateful notions superiority and inferiority, that are repugnant to decent people whose natural inclination is to then turn towards the main stream bourgeois liberal political parties for ‘just’ policies, which, on the surface, at least, do not appear to discriminate against people on the basis of race or culture, but are designed, in the long term, to bring about the entire destruction of their culture – of all culture – and to replace it with an unbridled global financial and industrial complex totally unfettered by national boundaries and law.